Notes: Until 1884 this station was the branch terminus. 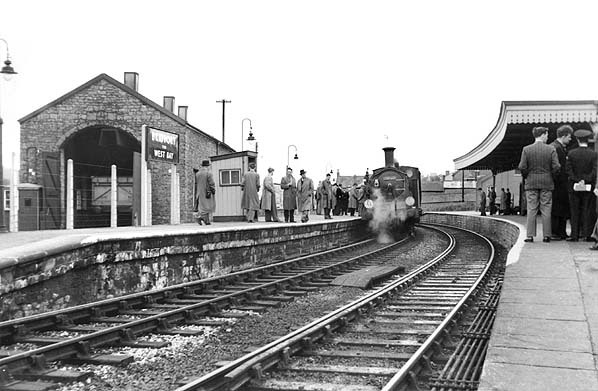 The original platform and station building were on the west side of the track, the building being of limestone with the stationmaster's office at the northern end, followed by the booking office, booking hall, and a ladies' waiting room and toilets. Although the platform was on a curve, a trainshed of rectangular plan covered it and the adjacent track. The passenger station and goods shed was built by James Gerrard for £1,300. The goods facilities were north of the passenger station, to the west of the running line. A locomotive shed was east of the passenger station. It was a stone-built one-track straight dead-ended shed with a gable style slate roof. Existing cottages close to the station were renovated as accommodation for porters, the engine driver and stationmaster. It was hoped to use modern coal gas to light Bridport station, but Bridport Gas Company demanded £60 and a guarantee that 16 lights would be burned from the supply. Such a promise could not be given, so the platforms at Bridport and Powerstock were lit by naphtha gas provided by the GWR’s suppliers. to south, following the curve of the platform, and ended with a screen built of stone with a glazed upper section; the canopy valance extended the length of the screen. Between 1887 and 1902 Bridport had ‘Bradpole Road’ added to distinguish it from East Street on the West Bay extension. Originally the signal box was located on the platform south of the station building, but in the remodelling it was replaced with a box on the north end of the up platform, and a further box was north-east of this, on the down side of the branch. and dealt with 47,083 tones of goods and 469 cattle trucks. 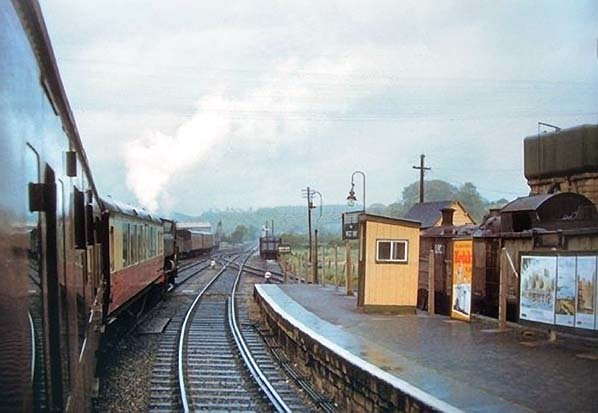 Goods services were withdrawn on 5 April 1965 and the sidings had been lifted by 1968, leaving only the single passenger track to a point a short distance south of the station. 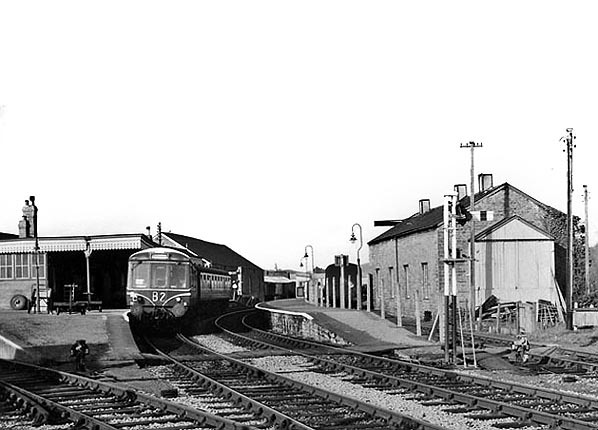 On 6 October 1969 Bridport station ceased to be staffed. Nevertheless the station building and platform awning were retained, and the gas lighting remained in use. Whilst the down platform had Southern Region-style gas lighting, an ornate GWR standard of hoop design remained at the southern end of the up platform until closure. used in the construction of the railway station at Pecorama in Beer, Devon, including roofing slates and platform kerbing slabs. 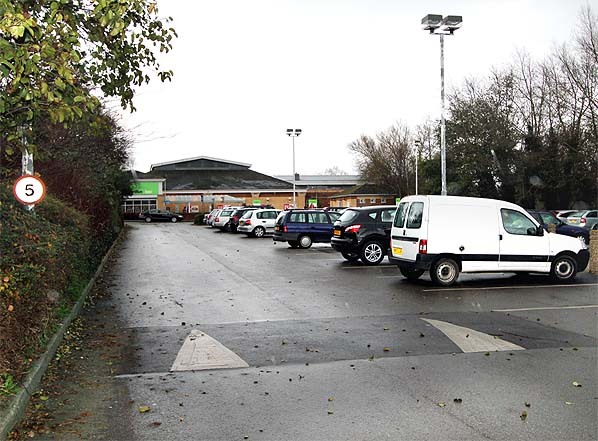 The site of Bridport passenger station is now occupied by a co-op supermarket. The old goods sidings and building are now occupied by a plumbers’ merchants. A further warehouse of railway origin stood to the north of the yard site until 2009. A number of proposals were put forward in the 1840s to connect the small Dorset town of Bridport by railway to a main line. The Wiltshire, Somerset & Weymouth Railway was to run between Weymouth and Chippenham, passing through various towns, including Bridport. The Bristol & English Channel Railway would link Bridport with Stolford, near Bridgwater (Somerset). A further proposal was for a line from Bridport to Watchet, in Somerset, and there was also a plan for a line from Maiden Newton to Exeter via Bridport, Seaton and Honiton. However none of these schemes went ahead. Eventually the reluctance of main line companies to provide a link to Bridport encouraged a syndicate of Bridport residents to undertake the task themselves. Engineer, and Kenneth Mathieson was awarded the contract to build the 9¼ miles of railway at an estimated cost of £65,000: the work was expected to be complete by late 1856. On 19 June 1855 the first sod was cut by Joseph Gundry, company Chairman, at Loders between Powerstock and Bridport. However, difficulties with stabilising the earthworks along the route, particularly north-east of Powerstock, resulted in a year’s delay in completing the project. At Witherstone where the railway cut through the hills, a slippage occurred in a large cutting; one of the slips required purchase of extra land from a Mr Jenkins, in return for which a 50ft siding was provided for his use. The line was constructed with bridges which could accommodate only a single track. The ‘MacDonnell road system of Permanent Way’ was used, with rails mounted on longitudinal iron sleepers. 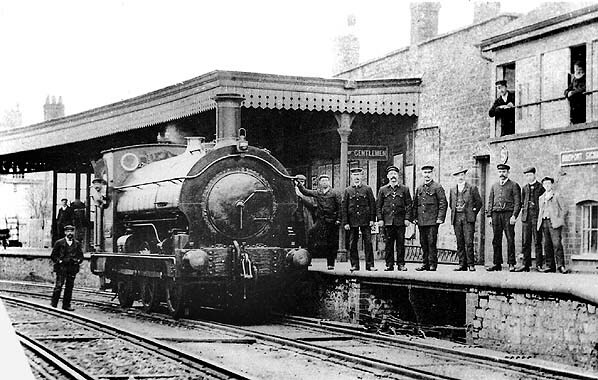 The Great Western Railway (GWR) broad gauge of 7ft 0¼in was used, as on the Weymouth – Westbury line. (The branch was converted to 4ft 8½in standard gauge on 19-21 June 1874.) In May 1856, as a result of public pressure, the company decided to provide intermediate stations at Smokeham (Powerstock) and Toller, but they were to be built as cheaply as possible and closed if they proved unremunerative. Inhabitants of Loders requested a station, but their wishes were not granted. In October 1857 the Board of Trade Inspector, Captain identified features of the line’s engineering which required rectification. When these had been attended to the railway officially opened on 12 November 1857, the Board of Trade having authorised its use the previous day. The GWR operated the line with its own steam locomotives and rolling stock – and eventually bought the branch in July 1901.
simply, as Toller – and this was also an inexpensive structure. The intention was to provide a passing place at Powerstock but this was never installed, and, throughout the life of the branch, trains could cross only at the Toller goods loop, operated by a key on the electric train staff. The early days of the railway were not without incident. On Boxing Day 1857 vandals placed iron rails across the track at Toller, and on 8 January 1858 a large boulder was dropped on the line at Bridport. On 14 April 1858 cash was stolen from Powerstock station while the stationmaster was at church. Within twelve months of opening another major landslip occurred at Witherstone, and drainage works were required to make the earthworks safe. Some 20,000 cubic yards of spoil had to be removed - but it was found to be suitable for brick-making and was sold at a profit. After leaving Maiden Newton the Bridport branch crossed the River Frome and fell on a ruling gradient of 1 in 100, before climbing at 1 in 150/200 to Toller station. Beyond Toller the line rose at 1 in 85 across moorland to a board reading ‘All goods and mineral trains must stop dead here’. Beyond was a fall at 1 in 37 through a belt of woodland to Powerstock where it became level. Another stop board lay 70 yd beyond, following a ruling gradient of 1 in 52 down to Bridport, the last half mile following the River Brit. Shortly after the opening of the branch the Bridport Company considered plans for its extension. In 1859 West Dorset Railway scheme would continue the line to Charmouth, and in 1860 there was a scheme for the Bridport, Lyme Regis & Axminster Railway. These were not proceeded with, and in 1863 a proposed line from Clapton Bridge (Crewkerne) to Bridport Harbour was opposed by the Bridport Company. The more modest decision was taken to extend the branch to the coast at Bridport Harbour, and on 21 July 1879 this was authorised by an Act of Parliament. The Bridport Company had authority to raise a capital of £42,000 and borrowing powers of £14,000. The GWR agreed to pay £12,000 towards the cost of construction. Mousley and Lovatt were chosen as the main contractors for the work which began in 1883.
appealing name of 'West Bay'. The extension opened on 31 March 1884, when 5,100 passengers used the new line, including 1,100 Sunday school children who were not allowed out of the train at West Bay owing to the inclement weather and were taken straight back to Bridport. Most of the railway’s directors formed the West Bay, Bridport, Land Building Co Ltd to develop a town at the terminus, with an esplanade, hotel and houses. As a result of this initiative The Neptune public house became The West Bay Hotel and Pier Terrace was built in 1886 as terraced holiday houses. Previously the GWR’s only foothold on the coast east of the River Exe was at Weymouth, and West Bay promised to strengthen the GWR presence on the Dorset coast. However, after a promising start, West Bay failed to develop into anything more than a large village. The original passenger service of five trains each way from Monday to Saturday took about 35 minutes to travel 11¼ miles; in the following month the service was reduced to four trains each way. In June 1865 five down and four up trains operated, with two each way on Sundays. In 1884 there were seven trains between Maiden Newton and Bridport, four continuing to West Bay. In 1938 eleven down and ten up trains ran, with six each way on Sundays. At first the branch was worked by broad gauge 4-4-0STs including Theocritus and Hesiod. In 1862 Aries and Virgo ‘Leo’ class 2-4-0STs were used. ‘Victoria’ class 2-4-0 Brindley also appeared, though tender engines were rare. In standard gauge days 0-6-0STs were used. Around the turn of the century Nos 1304-7, 4-4-0Ts, built by the Monmouthshire Railway & Canal Company and 0-4-4Ts Nos 1708-10 (once owned by the same company) appeared, the latter rebuilt as saddle tanks. When these left early in the twentieth century they were replaced with GWR 0-6-0STs and, in due course, by 0-6-0PTs. Passenger services on the extension were withdrawn as a World War I economy measure on 1 January 1916, to be restored on 7 July 1919. The service ceased again on 11 April 1921 only to resume exactly two months later. On 24 September 1924 trains were withdrawn for the winter season but began once more after a fortnight, on 6 October. The volume of passenger traffic between Bridport and West Bay was disappointing, as the intended holiday destination had failed to become a serious rival to established south coast resorts, and visitors now preferred to arrive by motor bus or car. Passenger trains were finally withdrawn from 22 September 1930, but goods traffic continued to use the line. In 1935 a camping coach was installed at West Bay (and in 1936 another was placed at Powerstock). From 3 December 1962 goods services ceased between Bridport and West Bay, but on 25 August 1963 two GWR steam locomotives hauled a special passenger train on this section of line. Two years later the track was lifted. June 1936 48XX class 0-4-2T No 4803 had appeared and 74XX class 0-6-0PTs arrived soon after. In 1941 45XX 2-6-2T No 5555 worked the branch. At Nationalisation on 1 January 1948, the Dorchester – Yeovil line and the Bridport branch were allocated to the Western Region. However on 2 April 1950 these routes were transferred to the Southern Region, which installed totems in its green livery at Maiden Newton, but not at the Bridport branch stations, perhaps implying that the branch was not expected to survive long. On 1 January 1963 all stations north of Dorchester West, including the Bridport branch, were restored to the Western Region, but no chocolate-and-cream signage is believed to have been given to the branch stations in this era. the ten weekday trains an extra late working on Thursdays and Saturdays left Bridport at 9.05 pm, and there were three trains on Sundays. Sunday services ceased in 1962. The DMU came daily from Weymouth, and when that shed closed in 1968, the working was covered by Westbury depot. If it lost its path on the single line and was late arriving, a taxi had to be substituted. Following the dieselisation of the passenger service, goods trains continued to be worked by 57XX class 0-6-0PTs and latterly Ivatt class 2 2-6-2Ts until this traffic ceased on 5 April 1965. From this date the branch was operated as a single line siding, the only signals being at Maiden Newton. The Bridport branch was earmarked for closure in The Reshaping of British Railways (‘Beeching Report’). Formal publication of the proposal to withdraw passenger services took place on 7 October 1965, but on 1 June 1967 the Minister of Transport refused consent to the closure on the grounds of hardship that would be caused – the only criterion allowed for the rejection of the proposal. The railway route between Maiden Newton and Bridport was far more direct than that by the major road, and the intermediate settlements of Toller and Powerstock / Nettlecombe could be reached only by narrow, minor roads. A subsidy from Dorset County Council enabled the service to continue. Powerstock. 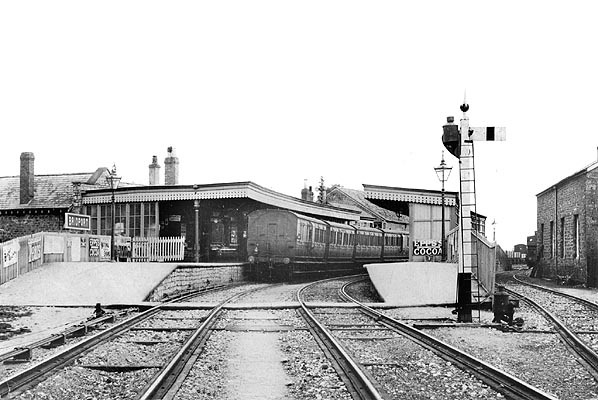 Bridport station was unstaffed from 6 Oct 1969. The May 1974 timetable showed nine trains in each direction on the branch. 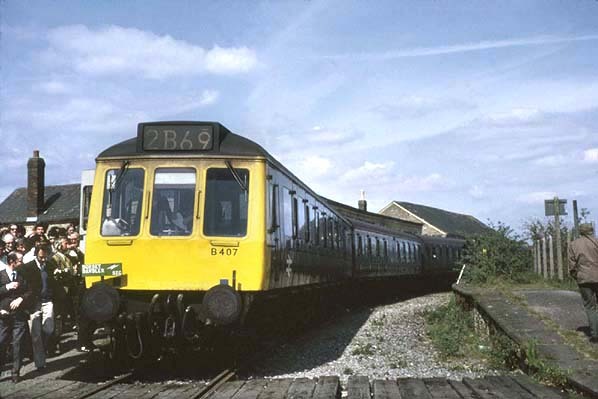 A further enquiry into the viability of the Bridport branch found that a suitable replacement bus service could be provided, and the final passenger trains ran on Saturday 3 May 1975, official closure taking place on Monday 5 May. 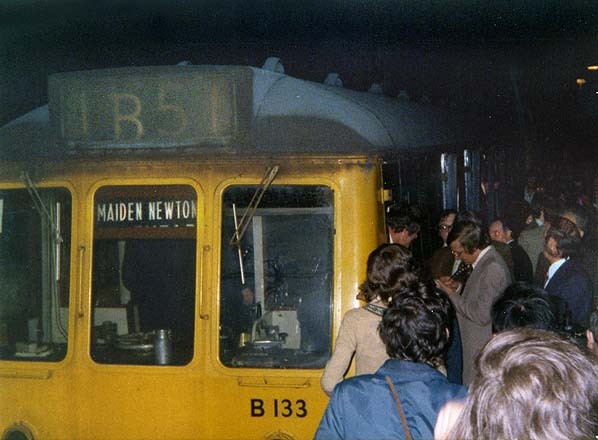 Lifting of the tracks began on 18 November 1975. Shunter 08 636 was temporarily stabled at Maiden Newton for working the brake van and winch, bogie and roller wagons of the lifting train. The junction station at Maiden Newton remains open to trains on the Heart of Wessex Line. Part of the Bridport / West Bay line can be enjoyed on foot and cycle from Maiden Newton station for about half a mile, and along parts of the old line past Toller Porcorum. Sustrans have funding to use the old line as a cycle path from Maiden Newton to Bridport. junction with Burton Road and West Bay Road. Sea Road North uses the former trackbed between East Street and Bradpole Road stations. Gerry Andrews. Bradshaw from Nick Catford. Route map drawn by Alan Young. platform in front of the building. 1888 1:500 OS town plan. The single platform of Bridport passenger station can be seen west of the running line with the main building. Booking and other offices are identified within the station building, and a signal box is placed at its southern end. A separate building to the north might contain waiting facilities. A trainshed of rectangular plan shelters the curving platform and track. East of the trainshed a loop line provides access to a single-road engine shed and a siding. North of the passenger station one track enters the goods shed, flanked by three sidings, the most northerly provided with a crane. 1902 1:2,500 OS map. Since the edition of 1890 the station layout has been altered with the addition of a second platform and removal of the trainshed. There is only one signal box on a new site on the platform just north-east of the station building. Cattle pens have been added to the goods facilities. Bridport station looking north early in the twentieth century. 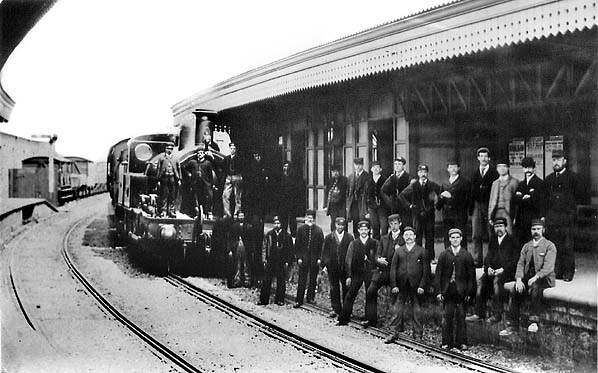 Even a small town station would boast a large workforce in these days, and the photograph might have been taken at a shift change so that everyone could be included. The wooden building and awning on the relatively new down platform was similar in length to its counterpart on the up platform, but it was dismantled by the mid 1950s. Bridport station looking north prior to October 1910. The station had been remodelled in 1894, involving the removal of the trainshed and the addition of a down platform. 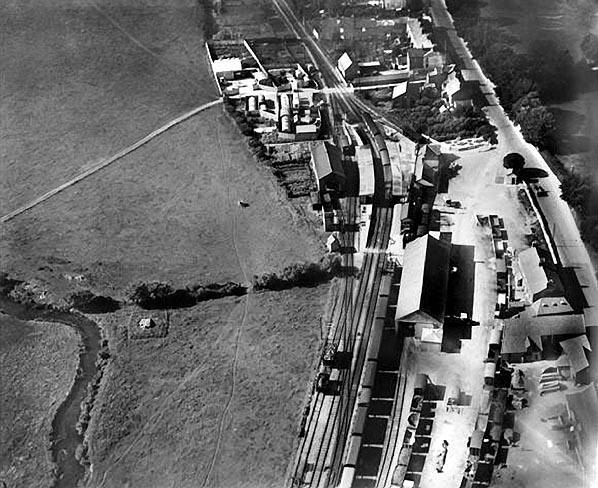 An aerial view looking south over Bridport station in September 1928. The goods depot, to the right of the passenger station, the engine shed (left) and the track layout are clearly seen. Awnings provide shelter on both of the platforms. In August 1947 a pannier tank locomotive has drawn a passenger train into the up platform at Bridport. The down platform still has its timber building and awning, which would be demolished a few years later. Note the gas lamp in the foreground. A general view of Bridport station looking south-west c. mid 1950s. The goods depot is on the right, with the engine shed (a sub-shed of Weymouth) on the left. A tank engine sits in the shed road. The shed closed 15 June 1959. 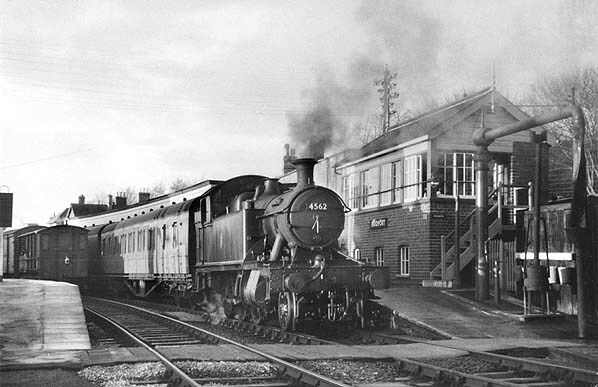 4562 prepares to haul a passenger train from the up platform at Bridport in January 1956. Goods wagons occupy the down platform. On 7 June 1958 the ‘South Dorset Rail Tour' calls northbound at Bridport, having visited the extension to West Bay which is normally used only by goods traffic. This excursion was organised by the Railway Enthusiasts’ Club and was formed of a push-pull set hauled by 30107. It originated from Bournemouth West and also visited the Hamworthy branch, the remaining stub of the Abbotsbury branch at Upwey, and the Easton (Portland) branch, all of which were normally open only to goods traffic. The enthusiasts are as typical a group as one might expect on such an excursion in 1958. Most (or all) are male, clothed in suits, sports jackets or overcoats: the age of the ‘anorak’ had not yet dawned. The engine shed appears to be occupied by a wagon; the shed closed a year later. The wooden buildings on the down platform had been recently demolished. Looking north-east from a passenger train about to be steam-hauled from Bridport to Maiden Newton in May 1959. Diesel multiple units took over the services the following month. Note the engine parked behind the down platform on the right, the fine array of BR posters (right foreground) and the coaches on a siding in the distance. 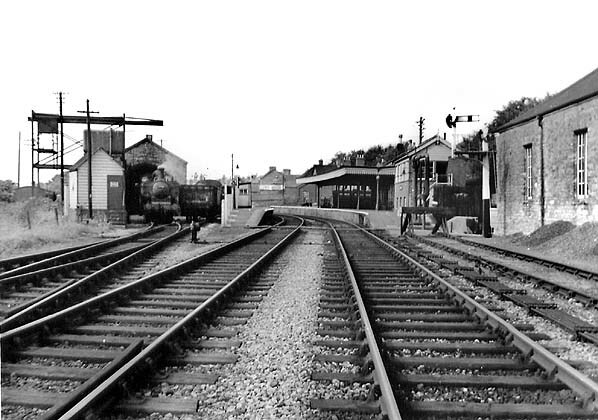 Bridport station looking north in April 1963. The DMU, in green livery with ‘whiskers’ painted on the cab, is at the up platform. The old engine shed is on the extreme right. By the 1970s passenger numbers were so low that a single-car DMU was sufficient for the service. This view is 26 April 1975, 9 days before the station closed. 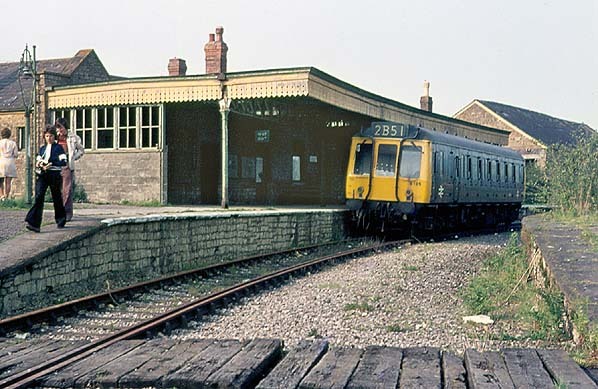 Bridport station on 3 May 1975, the last day of public service. This DMU carries the headboard of the Southern Electric Group's Dorset Dawdler railtour. This tour didn't, however, visit Bridport. It ran from Southampton to Eastleigh, making a lengthy stop at Maiden Newton. There was sufficient time for enthusiasts to leave the train and make two return journeys on a regular service DMU to Bridport. Somebody removed the headboard from the railtour and fixed it to the front of this train. 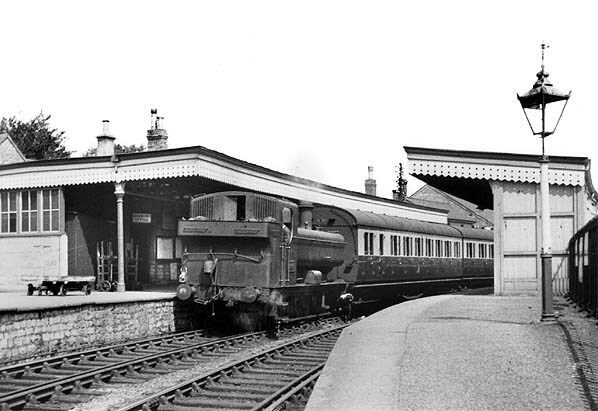 The last train from Bridport awaiting departure for Maiden Newton on 3 May 1975. 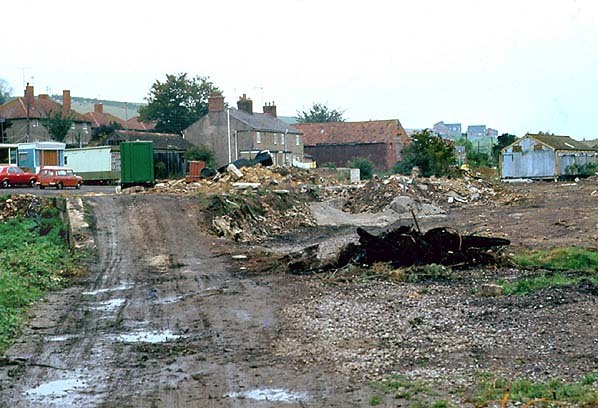 The very degraded remains of Bridport station in August 1977. The edge stones for the goods bay are still in place but those on the main platform have been removed prior to final demolition. A timber grain store standing on staddle stones is seen on the far right. The larger goods shed (which stood until 2009) is out of view to the right. The site of Bridport station looking north in December 2011.